The weaving traditions in West Timor are very diverse and very beautiful, consisting of hand-made cloth woven on back-strap looms, sometimes still using handspun thread and natural plant dyes. The textiles are woven by village women amongst other activities such as growing crops, caring for livestock, social, domestic and family duties. 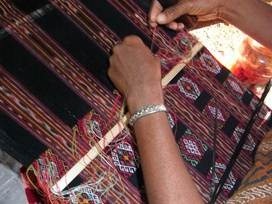 Weaving skills are passed down from one generation to the next, with most women learning from their mothers, aunties or grandmothers. 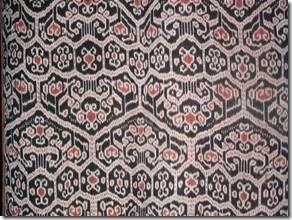 Traditional hand-woven textiles are still used as garments by many West Timorese for formal and ceremonial occasions, and textiles are still required as tribute for funerals, as part of the bride-wealth exchange in marriage agreements, and for other adat (traditional customary law) ceremonies. Despite this, the weaving traditions are fragile and vulnerable to changes in contemporary life, as the younger generations move away from villages, or become less interested in traditional textiles and the time-consuming techniques of hand-weaving. West Timor is the western half of the island of Timor, which was colonized and divided by the Dutch and Portugese during the colonial period. West Timor became part of the Republic of Indonesia when it was formed in 1945 as a reaction to Dutch colonial rule. Within Indonesia, the eastern islands (West Timor, Sumba, Flores, Alor, Rote and Savu) are the poorest part of this developing country. The islands of East Nusa Tenggara, or NTT as it is called locally, are much drier and less fertile than those of western Indonesia, and very similar to northern Australia in their climate, geology and vegetation. The island of Timor is predominantly limestone, and does not have the rich volcanic soils of Bali or Java. It has a very long dry season, from April to late November, and is hot and extremely dry for most of the year. The latter part of the dry season is traditionally known as musim kelaparan, or the starvation season, as the only foods available for most villagers are the corn and cassava they have stored from the end of the harvest period. Life for most villagers is very tough and means of generating income are very limited. Many village children do not go beyond a primary school education as their families do not have the resources to support further study. Since the late 1990’s life has been increasingly difficult for the West Timorese, due to a series of factors such as the Indonesian Monetary Crisis in 1997, a rise in the cost of living of more than 500 per cent over the past 10 years, and the withdrawal of aid projects and organisations in the wake of East Timor’s independence in 1999. There is a general lack of knowledge about West Timor caused in part by the attention to East Timor in the news media, and this often makes it difficult for organisations to get external funding or support for their activities. Ibu Yovita Meta began the foundation Yayasan Tafean Pah in 1989, working with a small group of weavers from the dry and mountainous Biboki region of northern West Timor. YTP has grown substantially over the past 20 years; it now has a base in the northern town of Kefamenanu and 14 weaving cooperatives with a total of 700 members, spread over the Biboki, Insana and Miomafo regions of TTU (North Central Timor). Yayasan Tafean Pah supports the weaving cooperatives by providing access to thread and dyes, and training in weaving, dyeing and design skills. The foundation also provides cooperative management and basic accountancy training, and very importantly, provides an outlet and market for the beautiful hand-woven textiles which the weavers produce. In 2003, Ibu Yovita won the prestigious Prince Claus Award for Culture and Development (awarded by the Netherlands government) for the work she has done with Yayasan Tafean Pah. The award was used to develop the Rumah Seni Tafean Pah in Kefamenanu, a cultural centre which includes the YTP office, a multi-functional work space, and a gallery/shop outlet for the textiles and associated products made by the weavers. 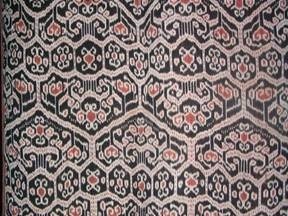 In 2007, Yayasan Tafean Pah received a grant from the Dutch Embassy in Jakarta specifically for the purpose of creating a collection of traditional hand-woven Biboki textiles. This collection is intended as a permanent resource for the community, ensuring that examples of the techniques, motifs, designs and textile forms unique to Biboki hand-woven textiles are held in West Timor, rather than only in the collections of distant or foreign museums. The textiles which make up the collection were commissioned directly from weavers in the YTP cooperatives, supporting them financially and increasing their sense of pride in their work. Textiles produced by the weaving cooperatives reflect the traditions which have existed for countless generations in these regions. Some of the weavers specialise in textiles made with hand-spun thread and dyed with traditional natural dyes, such as the rich reddish-brown Morinda Citrifolia, the deep blues of Indigofera Tinctora, and blacks from iron-rich mud. Other weavers use machine-spun thread to create lighter-weight textiles which can be made up into smaller items such as bags and clothing. 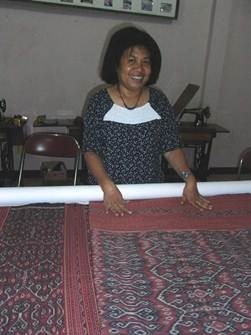 YTP sells the textiles through its base of the Biboki Arts Centre in Kefamenanu, and through trade fairs and exhibitions in Jakarta and Singapore. With the support of the Museum and Art Gallery of the Northern Territory there have also been several exhibitions of Biboki textiles from Yayasan Tafean Pah in Darwin. The aims of Yayasan Tafean Pah are to ensure that traditional weaving and dyeing skills are sustained, and to support village women to develop economically through their weaving skills. 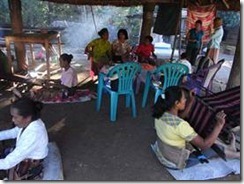 In a culture such as that of West Timor, a woman’s status and standing within a village community increases significantly when her weaving contributes to the family’s economy. One of the YTP cooperatives is comprised predominantly of widows, and most of these women have put their children through senior high school and university on income derived from their weaving activity. Due to the success of its existing cooperatives, YTP is continuously requested to take on new groups, some of which have little prior weaving or dyeing knowledge. Although this is a huge burden on the organisation, it also indicates the potential for a remarkable revival and continuation of skills and traditions. Yayasan Tafean Pah has no continuous funding and relies on sales of textiles to support its ongoing activities. Any new initiatives require external funding as the foundation survives on a day to day basis due to the unpredictable nature of selling textiles. Because of the difficulties of this situation we have decided to begin a support project called Friends of Yayasan Tafean Pah. Through an informal network of email lists we will regularly send out information about specific projects and activities which YTP wishes to seek funding for. A data base has been set up to record information about all donations and ensure transparency. Friends of Yayasan Tafean Pah has been created by Ibu Yovita Meta and Ruth Hadlow with the intention of helping YTP to source funding through Australian textile networks and other interested parties. Ruth Hadlow is an Australian artist who has been resident in West Timor since 2001. From 2005-2009, Ruth and her Timorese husband Willy Daos Kadati ran Babes in Timor/Mepu Mfe Fafi, a small aid project dedicated to supporting the West Timorese community through donations of piglets from Australian sponsors. Ruth Hadlow and Willy Daos Kadati run textile and cultural tours to West Timor and other parts of eastern Indonesia, and have had a close relationship with Yayasan Tafean Pah for a number of years. If you would like to become a member of Friends of Yayasan Tafean Pah, you can contact us directly, or simply continue to receive our emails and respond as you wish to the various projects. If you have friends or family whom you think may be interested, please pass this information on to them. If you do not wish to receive emails from Friends of Yayasan Tafean Pah, please let us know and we will take your address out of the email list. Yayasan Tafean Pah plans to begin a training program in the latter part of 2010, with the aim of training young women in weaving skills. 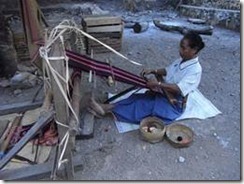 There are 4 main weaving techniques used in the TTU region of West Timor: futus (warp ikat), sotis (float or pickup warp), buna and pa’uf (discontinuous supplementary weft techniques). Each of the techniques is slow and time-consuming, requiring patience and attention to detail. 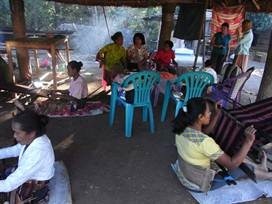 The majority of weavers in West Timor are older women, a matter for some concern as the weaving traditions could disappear within a couple of generations if younger women do not take up weaving. Due to the success of the existing YTP weaving cooperatives, it has become visible to the broader West Timorese community that woven textiles can provide a useful source of income. This provides a good incentive for encouraging young women to learn weaving skills as a realistic alternative to other types of income-generating work which require them to leave their villages. Yayasan Tafean Pah intends to start the training program with groups of 10—15 young women who will be paired with experienced weavers, either in their village setting, or at the YTP Centre in Kefamenanu. The young women will begin by learning basic weaving skills, and also, if they choose, they can learn to hand-spin cotton with a drop spindle (a difficult process if you didn’t start at age 5, as some of you know!). 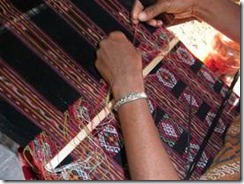 If the young women already have some basic weaving skills, they will be trained in more complex techniques such as buna, pa’uf or sotis to increase their skill base. The training will take the form of 5-day intensive programs, after which time the young weavers will be encouraged to continue their work independently, and the results will be assessed by YTP once the woven textiles are finished. If they require or request further training, they can undergo a second stage of training to increase their weaving skills, or begin producing textiles under the supervision of a YTP weaving cooperative. In the long term it is hoped that the young weavers might start new weaving cooperatives or join existing ones, as a means of developing and marketing their work. In order to run the training program, funding is needed to cover the costs of transport, food, and wages for the weaving teachers, who will give up their own weaving time to train the young women. A wage also helps to acknowledge the skills and experience of the older weavers, encouraging the community to value and respect the women’s textile skills and perceive these as an important source of income. YTP is hoping to take on between 60-100 young women in the training program at the first stage, making this quite a large and ambitious project which is intended to have a major effect on the survival of the weaving traditions in the TTU region of West Timor. If you are interested in supporting Yayasan Tafean Pah in this program of training young weavers, please use the form on the following page to make a donation. We would like to thank you for your interest in the activities of Yayasan Tafean Pah. If you visit West Timor and can come as far as Kefamenanu, we would love to meet you and introduce you to some of the weavers you have generously supported. For many years I am following YTP and am looking forward to visit Kefa again. You do wonderful work. Go on!!!!!!!!!!!!! !